Are you looking for a Ggrandfather Clock? Is your precious timepiece in need of service or repair? 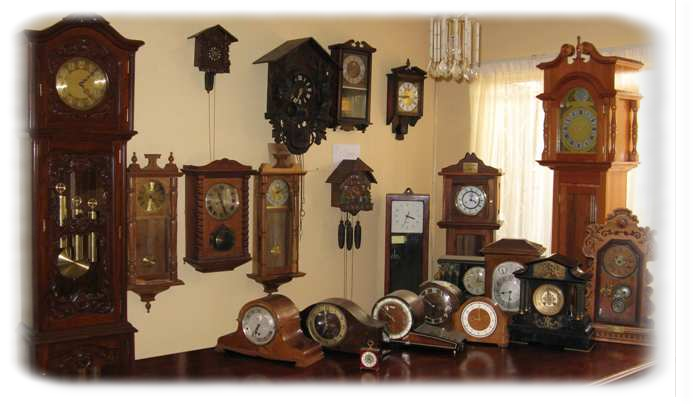 Look no further than the professionals at Grandfather Clocks Manufacterers and Antique Clocks Repairs located in Johannesburg, South Africa! Grandfather Clocks Manufacturers and Antique Clocks Repairs offers premium quality handmade clocks. Manufactured to highest quality standards and with finest solid woods, our Grandfather clocks belong to the best you can buy. We provide 5 year guarantee for Grandfather Clocks manufactures. Please visit the Antique Clock Galleries by clicking menu to view our antique grandfather clocks. We also provide clock repair and restoration services for the finest timepieces, including grandfather clocks to antique clocks and cuckoo clocks. Grandfather Clocks Manufacturers and Antique Clocks Repairs offering high quality repair and restoration service, whether you just need a house call to fix something on the spot, or whether you want your clock taken into our workshop for a complete overhaul. All our repairs is guaranteed for 2 years. Each clock is thoroughly checked & tested before it is sent out for final delivery. We can repair any type of antique clock. We don’t just give your clock a quick wash through, we strip it right down, clean it thoroughly in sonic tanks, and polish every single part before re-assembly. Re-bushing is standard, where required, but we can also re-pivot, mend broken teeth, have new wheels and pinions cut and replace most broken or badly worn parts. We also can provide a complete restoration service for wooden clock cases.